Discover the city’s neighborhoods and points of interest and explore the beautiful surrounding region with suggested itineraries and excursions. Enjoy the outstanding attractions and celebrated museums that San Francisco offers for the entire family. With a wide selection of specialty stores, designer boutiques and department stores San Francisco is a shopper's paradise. The abundance of fresh local produce, seafood, many renowned chefs, and ethnic cuisines make San Francisco a gourmet destination. Chaperon is published annually in eight editions: German, French, Spanish, Italian, Portuguese, Japanese, Chinese, and Korean. Pick up a free copy of Chaperon in your language! Chaperon is a free comprehensive multilingual guide to San Francisco designed for the foreign visitor not familiar with the local language and customs. It features complete detailed maps of the city and the surrounding region, statistics, practical information, suggestions and specific directions for walks in San Francisco as well as excursions around the Bay Area. 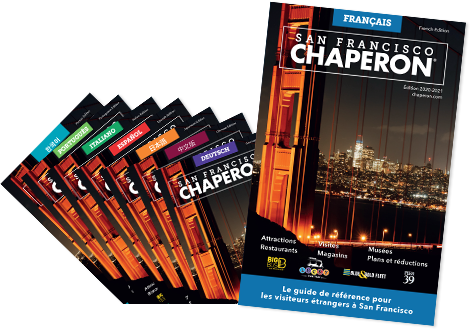 San Francisco Chaperon is published annually in eight editions: German, French, Spanish, Italian, Portuguese, Japanese, Chinese, and Korean. No English edition is available.